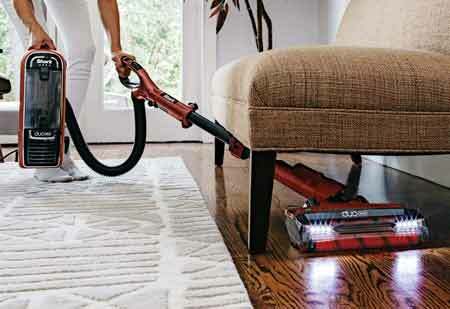 The Shark Apex DuoClean SQU922Q vacuum is another advancement in Shark Vacuums. What sets this premium model apart is the new DuoClean Cleaner Head which has a bristle brush to deep clean carpets, and also has a soft brushroll tackle larger particles and dust on hard floors. The QU922Q DuoClean gives you a combination of a lightweight upright along with a detachable lightweight canister vacuum (with powered brushroll). Never loses suction Technology gives this vacuum consistent suction power. To prevent you from breathing in the dust and dirt you are vacuuming, Shark has an Anti-Allergen Complete Seal Technology(tm) which traps 99.99% of dust inside the vacuum along with HEPA filtration. Lifetime HEPA filter. Swivel steering and smooth-gliding wheels provide easier maneuvering around furniture. Active-Glide™ Technology will maintain smooth maneuverability on both floors and carpets while also providing powerful suction. Built-in Headlights to see in dark areas, and find dirt and dust. Shark QU922Q DuoClean Upright Features: The Shark DuoClean includes a large capacity lift-away canister, so you can vacuum your stairs, under furniture, upholstery, drapes, ceiling fans, and other hard to get places. Suction control collar will allow you to lower suction for delicate areas, such as drapes. The Pet Multi-Tool can be used in smaller areas such as upholstery, stairs, car interiors, and under furniture. Main Brush has a 10-inch cleaning path and a .9 dry quart dust bin capacity. Accessories include: Pet Multi-Tool, Duster Crevice Tool, Fine Dusting Brush, MultiFLEX under-appliance wand. Shark Upright Vacuum Cord Length: 30 feet. Upright Vacuum Total Weight: 15.8 lbs. Smart-Review Commentary: The Shark Apex DuoClean QU922Q combines an upright vacuum with a “lift-away” canister. You can use the Pet Multi-Tool and Duster Crevice Tool on the wand when using the vacuum as a canister. What sets this one apart is the DuoClean powered brushroll, which has hard and soft bristles to tackle carpets and hard floors. To keep your air clean while you vacuum, the Shark has a sealed system along with a HEPA filter to filter out allergens and dirt. Noise Reduction Technology to soften the pitch of sound. Swivel steering makes it easier to maneuver than traditional fixed wheel vacuums. The vacuum includes LED headlights which will help you to see dark areas, detect dust and dirt, and avoid items you don’t want to vacuum. The Shark QU922Q compares favorably to Dyson vacuums. This “Speed” version has a smaller brush width, allowing it to get into smaller areas that larger vacs cannot. This model has received excellent reviews by consumers. Reviewers indicated that this model is great for pet hair, and easy to clean the brushroll. This vacuum comes with a 5 year limited warranty. This model is a Smart-Review top pick and a great value for both an upright and canister vacuum.